The pic below is my main ride. I run the FD off a Kelly Take-Off on the right side b/c a motorcycle accident paralyzed my left arm and hand a number of years ago. The set-up works great but from an aesthetic point I'd like to hide the cable under the bar wrap. I mean you gotta look good too, don't you? From what I understand Nkon cable/housing could handle bends like that but it seems it's only sold in sets for entire bikes and is quite expensive, especially since I'd only use a relatively small part of the set. I've used barcons when I set up a vintage bike. It works but is not as smooth as the Kelly set-up. I've had several surgeries and can twitch my fingers so maybe someday I'll have enough left hand grip to use a d/t shifter for the FD but I'm not there yet. So any ideas on how to make my current setup more aero but still as functional? I run a set of Kelly Take-offs on my rain bike for both front and rear shifting. I don't see any way to hide the cables without putting a severe bend or two in the housing which would most likely ruin the shifting quality. 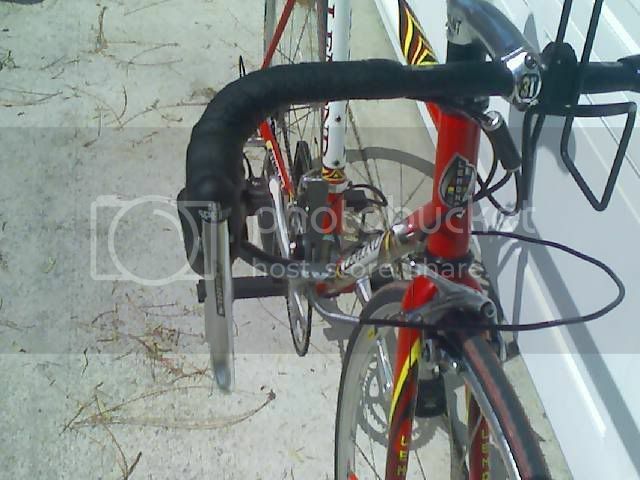 could you turn the noodle the other way and have the cable run along the unit and under the bartape? My thought exactly. Just pick a point for the cable to arc up and around and duck under the bar tape where it won't interfere with your grip on that side or shifting the grip from the hoods to the ramps. Yes, that can be done but it will require a pretty tight U-bend to make the housing follow the handlebar contour. It will probably be ok with a friction set-up but I'd worry about cable friction and it's effect on shifting with indexing. Give it a try but be ready to return to the unsightly external routing if it doesn't work. Sounds simple enough and I'll give it a go especially as I'm due fora new tape job now anyways. Thanks. The FD is friction shifted so here's hoping. Yeah, I forgot you use the TO only for the front. Should work. The works fine - my roommate did it.